The Gimp is undeniably a competent graphics editor, but it has a pretty steep learning curve, and it's a complete overkill if you only need to tweak a photo or a screenshot every now and then. In this case, you need something like Pinta, a no-frills image manipulation application that offers all the essential editing tools. Pinta is written in Mono which you must have installed on your system in order to run the application. The project's Web site provides binary packages for Ubuntu and openSUSE, so installing Pinta on these distros is as easy as it gets. If you find the Gimp's multi-window interface confusing, you'll be pleased to discover that Pinta sports a more traditional single-window GUI. Pinta's toolbox includes pretty much everything you need to tweak images, including Paintbrush, Pencil, Shapes, Eraser, and Selection. Pinta is at a relatively early stage of development, and it looks like a few tools such as Clone, Text, and Recolor haven't been implemented yet. Despite its simplicity, Pinta does support layers and unlimited undo/redo; features usually reserved for more advanced graphical applications. The current version of Pinta also offers a couple of effects such as Invert, Sepia, Black and White, and Auto Level, with more to come. Although Pinta is far from a finished product, it's pretty stable and includes the core features you're likely to use most. 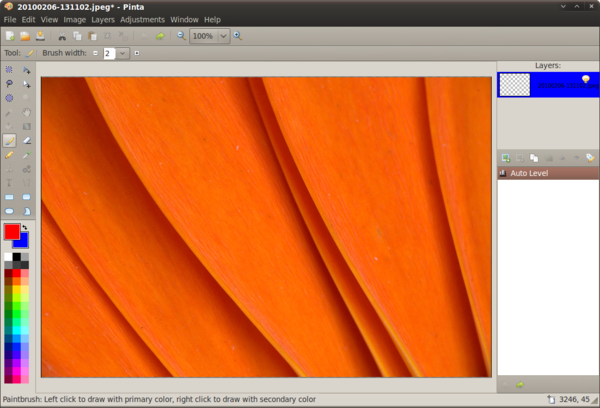 Even in its current form, it makes a good alternative to the Gimp as a fast and simple to use graphics editor. Gimp does not need to be overkill. The simplest tweak is to disable the saving of window positions (after setting them as you like them), so that Gimp always looks the same. It is a check-box under Edit -> Preferences -> Window Management. Gimp Paint Shop http://www.graphics-muse.org/artistsguide/?p=139 provides some ready-made configuration files and a guide to configuring Gimp. It might be nice to ship Gimp with a simplified interface configuration, with the option to unlock the full interface, as for instance Photoshop Elements does. Far better than the current proliferation of wannabee idiot-ware that so many developers seem to want to push on unsuspecting newcomers. You can use something that isn't encumbered by patents such as Kolourpaint or Krita.